Seriously? OMG! WTF?Salma Hayek Archives - Seriously? OMG! WTF? Most people around the World know François-Henri Pinault as Salma Hayek’s husband, but today we know the billionaire as the man who pledged €100 million to rebuild the Notre-Dame Cathedral. He is not the only French billionaire to do so. France’s richest man Bernard Arnault, the founder of the LVMH Group, doubled that offer according to CBS News. This is what billionaires should do because they cannot take it with them. Notre-Dame de Paris has survived since the first stone was placed in 1150, and it will live on for centuries to come. It has seen a lot of destruction around it throughout the ages, but now all of that sorrow has been burned away and new memories, hopefully, happier ones, will be made around it. This Easter, no matter what you practice, take a moment and be thankful that the Cathedral survived. It truly is a miracle. A place that brings people together for good lives another day. We need more places to bring us together and not tear us apart because at the end of the day we all are all born, bleed red and die. 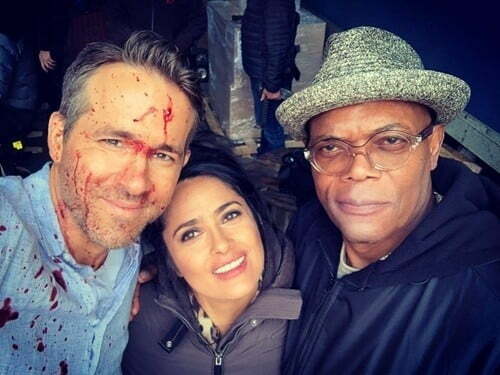 Did Salma Hayek go grey? A few weeks ago, Salma Hayek revealed that she had a few grey strands. Today, the 52-year-old posted a photo with much more salt than pepper, so has she officially gone grey? Not yet, but you will see her like that in the movie That Hummingbird Project that comes out on March 15th. If and when she does go grey, we know she will be just as beautiful. Nothing could ever make any less. Not even a unibrow! Salma Hayek’s driver license might say that she is 51 years old, but her face does not show it. Look at this photo of the Oscar winner just as she woke up and tell me that is the mug of a woman her 50’s. In fact, I think she might even look prettier without makeup and she is already a gorgeous woman. Don’t you agree?